On a chilly eve in late December 2014, Diane and I traveled from our suburban enclave to center-city Philadelphia, home to the region’s best concert hall (acoustically speaking, that is), the Kimmel Center. It was for no mere concert, however. It was for an audience with the queen – the Queen of Soul, Aretha Franklin. She was touring in support of her then-recent Aretha Franklin Sings the Great Diva Classics. Like I said, it was a great, if odd show. Other oddities: After 30 minutes, or thereabouts, she left the stage for a full 10 minutes. While the band vamped, we were treated to pictures from her holiday party. And, after singing with the Williams Brothers, she left the stage and let them take the spotlight for a few songs. It wasn’t the best concert I’ve seen in my life – but it gave glimpses of what Aretha must have been like in a live setting in, say, 1970 or ’71. The Allentown Morning Call reviewed the show, which can be found here. Philadelphia Magazine reviewed it, too. The weirdness of the show didn’t matter to me—Aretha invited us (the audience) into her world for a bit and played songs that are the heartbeat soundtrack to my life. Jeff surprised me with tickets to this show, which was a good thing, because the first time I saw Aretha was a show in Atlantic City, and I left it rather disgruntled with the idea of never seeing her live again. She barely acknowledged the audience’s existence and seemed put out at being there. This show—even with the pictures of her party and the Williams Brothers—was a much better memory to have of the greatest woman performer in rock and soul, the icon, the Queen. I walked down to the front when she performed the song that never gets old or careworn. Aretha may be gone but ‘Respect’ and her musical legacy will never suffer with the aging process. Thank you, Jeff, for getting those tickets! 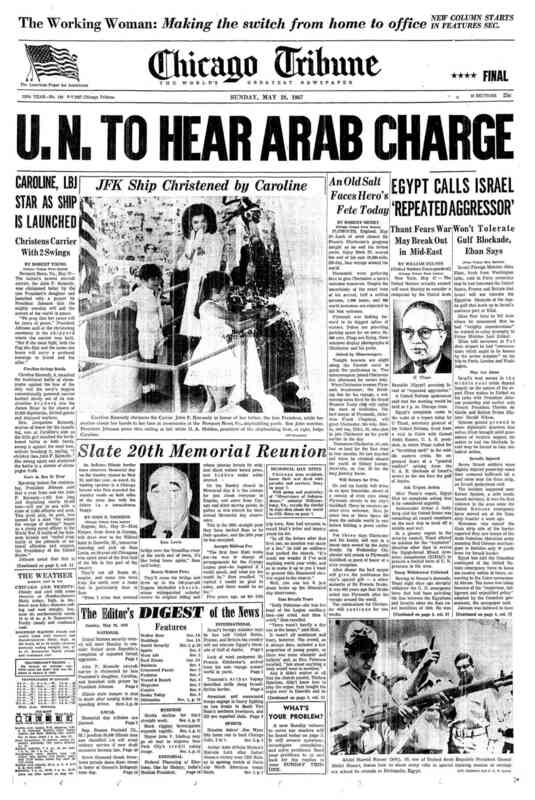 On this day in 1967, a Sunday, the Middle East was headed for the conflict known as the Six-Day War, which would begin on June 5th when Israel launched a preemptive strike against the Arab armies massing at its borders. Everyone talks about the working woman – but nobody knows her name. She’s been put under a microscope and dissected by the experts. She’s been told to stay home and do the dishes. And then she’s been told she can have any career she wants if she only lets herself have one. 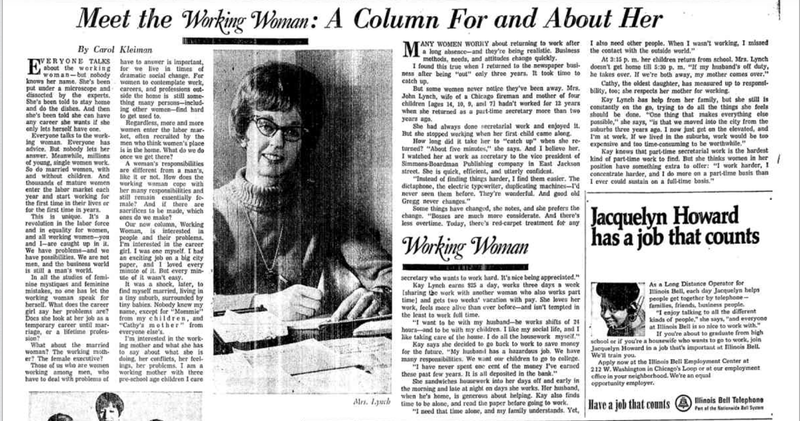 Everyone talks to the working woman. Everyone has advice. But nobody lets her answer. Meanwhile, millions of young, single work. So do married women, with and without children. And thousands of mature women enter the labor market each year and start working for the first time in their lives or for the first time in years. This is unique. It’s a revolution in the labor force and in equality for women, and all working women – you and I – are caught up in it. We have problems – and we have possibilities. We are not men, and the business world is still a man’s world. In all the studies of feminine mystiques and feminine mistakes, no one has let the working woman speak for herself. What does the career girl say her problems are? Does she look at her job as a temporary career until marriage, or a lifetime profession? Kleiman, as she notes in the column, was in the latter category. Unless my eyes deceived me, however, this Sunday edition of the Tribune doesn’t mention anything related to youth culture. Oh, it includes a few teen guest columnists weighing in on such subjects as patriotism and volunteerism, articles about folks in the entertainment world and one on classical music, but not one mention of any of this week’s top pop releases or hits or even Sgt. Pepper’s Lonely Hearts Club Band, which was due out in the U.S. on June 2nd. Not surprising, of course, but annoying to me all the same. Speaking of career gals and lonely hearts: 16-year-old young Wendy D. was eyeing a career in education; and, to that end, she belonged to the Future Teachers of America club at her high school. As for lonely hearts – well, she certainly wasn’t one. 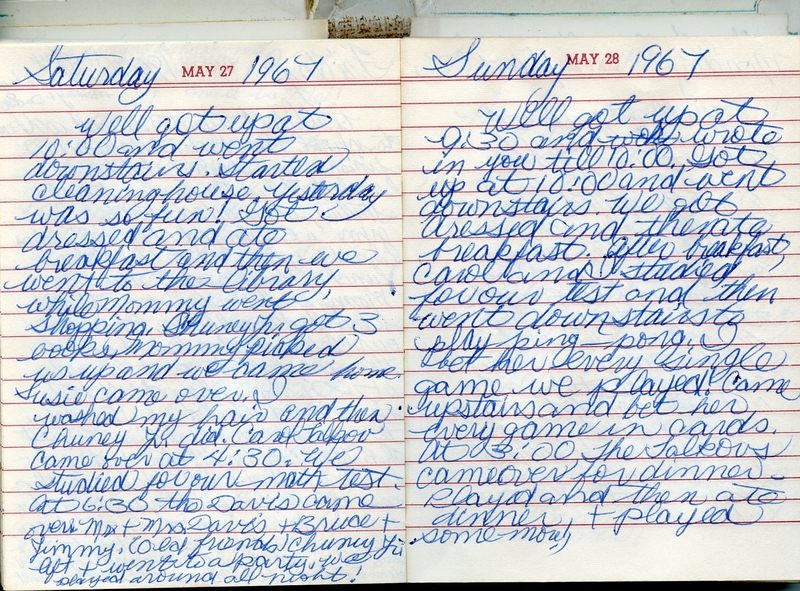 Valerie S., a few years younger than Wendy, was less about the lovin’ and more about studying and playing games. Ping pong! 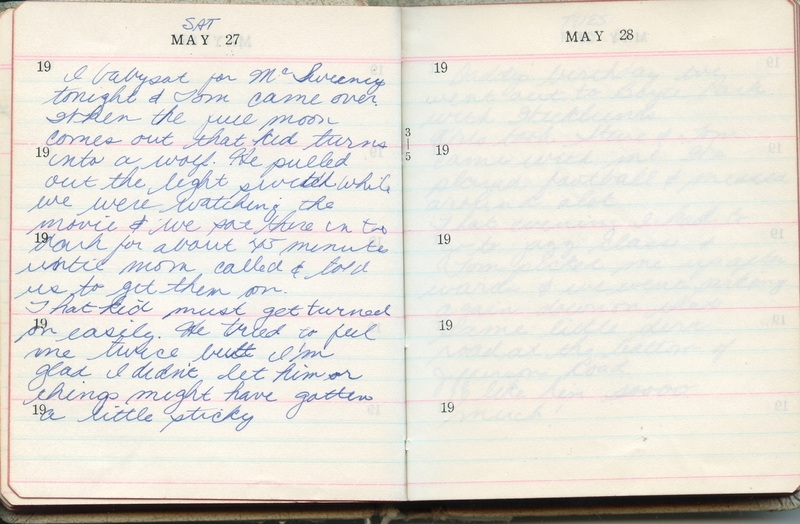 I share their experiences because, as I noted in the Top 5 for April 22, 1967, when we think of bygone ages – especially one as romanticized as the 1960s – we often imagine them as totally different from the present. The reality is often more mundane, however. Tectonic cultural shifts were underfoot, true, but the vast majority of kids, such as these two, still woke up, went to school, hung out with friends, dated and – as Wendy will in short order – dealt with strep throat. Some things change. Some things don’t. 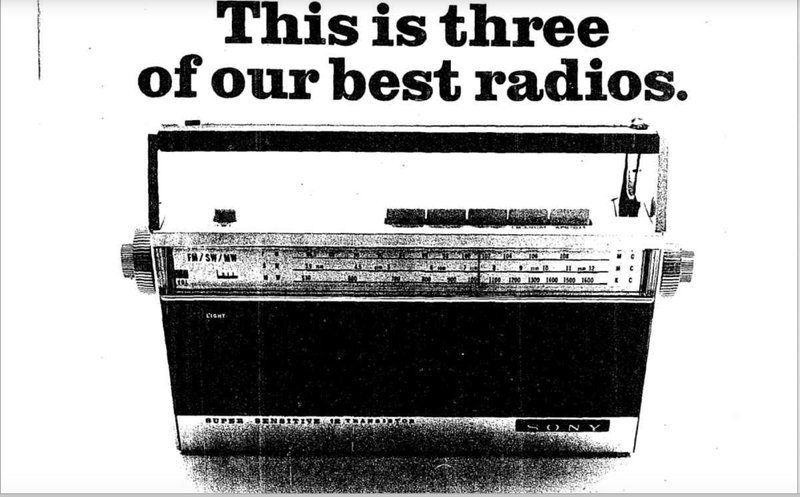 Oh, and here’s one other thing that attracted my eye while browsing the Tribune’s Sunday edition – an advertisement for Sony’s latest, greatest 12-transistor portable radio. It and radios like it, for those too young to know, were the iPods of the day. 1) The Young Rascals – “Groovin’.” The No. 1 song in the land, for the second week in a row, is this gloriously evocative song of summer. 2) Aretha Franklin – “Respect.” Jumping from No. 5 to No. 2 is this classic from the Queen of Soul. 3) Neil Diamond – “Girl, You’ll Be a Woman Soon.” Entering the Top 10 is Neil Diamond’s fourth single for Bang Records. It possesses a dramatic, brooding melody and lyrics that…well, what can be said about “Girl, you’ll be a woman soon/Please come take my hand/Girl, you’ll be a woman soon/Soon you’ll need a man”? That they reflected a certain mindset of their time? Or that they were just…creepy? You be the judge. 4) Eric Burdon & the Animals – “When I Was Young.” Dropping from No. 15 to 22 is this classic counterculture ode inspired by Burdon’s father. 7) And, finally: The times they were a-changin’. That’s for sure. On Thursday of the following week, aka June 1st, Jefferson Airplane flew onto the set of American Bandstand and sang the trippy “White Rabbit” and “Somebody to Love,” which had jumped from No. 22 to No. 17 and was about to rise even higher, No. 9, by week’s end.